I’m sure you guys have all seen the previews for that new freakshow movie, Possession. Typically, I’m not a fan of scary movies because I’m a fraidy-cat and also, my (newish, nice-ish) house suddenly becomes this creepy abandoned mansion whenever I watch scary movies, choosing to be all moan-y and creaky with branches scratching at the window panes. But the main reason I’m not going to see Possession isn’t because I’m scared of the movie, but rather, I have a scary, personal relationship with being possessed by a demon and the idea of some demon-child (side note: why are children always the possessed ones? Because they can pretend to be evil so easily? That’s what I thought, kids. Your crying over spilled milk act doesn’t fool me) running around with bats flying out of her eyeballs hits a little too close to home. So a few months ago, I was perusing Pinterest with my mom, trying to find cute haircuts to switch up my look. “Mom,” I said, “how about this one?” and pointed to a cute bob with some pixie bangs. “OMG, THAT’S SO CUTE!” my mom replied, probably not as enthusiastic as that, but whatever. I printed the picture out and booked my appointment with my stylist a few weeks out. Meanwhile, I went along my merry way. Yet the next day, something creepy happened. I went to style my hair before work and suddenly, my bangs had inched over just so. I tried spraying them down with a gallon of hairspray, only to have them fling back in the wrong direction like some pesky angsty teenager. “You’re grounded, a-hole bangs,” I’d curse them, and then I realized I was talking to my bangs and that’s frowned upon, y’all. Days passed and my bangs went PSYCHO. Like straight-up BANG CRAZY, PEOPLE. I tried pinning them when wet, blow-drying the living frizz out of them, using as much gel as Pauly D, and praying to hair gods for some kind of divine bang intervention but nothing. Then one morning, I woke up and my bangs? They looked like THIS. John Travolta in Old Dogs hair. I looked like John Travolta. This wouldn’t have been my worst nightmare had I been John Travolta circa Grease, but Old Dogs? Really? I had been a woman possessed… by hair. Anyway, I survived after a trip to the mall, some wine coolers and eventually, my haircut. However, now anytime my bangs begin to stray (like, UGH, right now) I get creepy shivers wondering if JT’s bangs will return and haunt my face like a creepy 50-year-old man haircut. I hope you know this has nothing to do with pizza. But science proves that eating Sugar Crumb Pizza can reduce the risk of paranormal entities screwing with your hairstyles. Fact. Another fact? This pizza is delicious and should be required to be eaten by your family. You’ll quickly become possessed by it, but that’s okay. Being possessed by a pizza is cooler than being possessed by John Travolta. 1. Preheat oven to 400 degrees F. Liberally grease a pizza pan with cooking spray. Roll the dough out onto the pizza pan in a circle. 2. 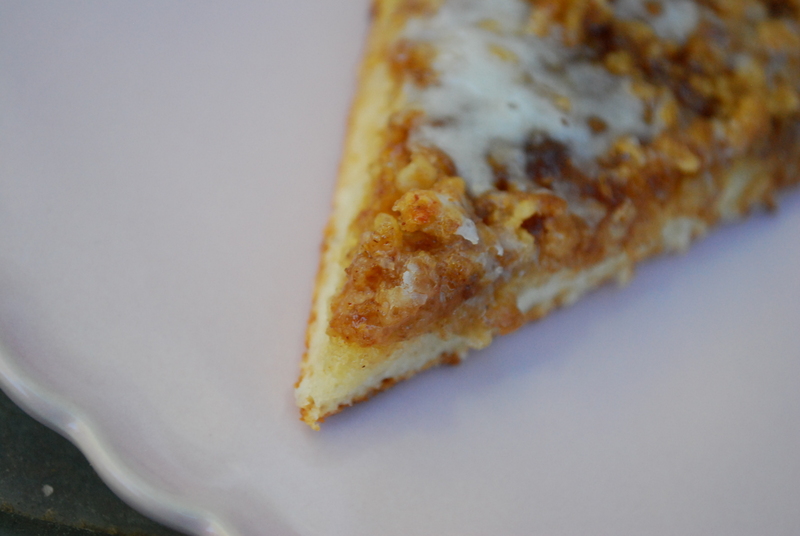 In a medium bowl, combine the butter, brown sugar, cinnamon, flour and oats with a fork until a creamy paste has formed. Spread the mixture over the entire pizza, laying it on thick. 3. Bake the pizza until golden and bubbly, about 12-15 minutes, watching it closely as not to burn it. Remove from oven and let stand a couple minutes. 4. Drizzle the icing on top of the still-warm pizza. Cut into wedges and serve immediately. This is best eaten the same day it’s made. It would also be great with a big plop of vanilla ice cream on top! Excuse me while I bury my sorrows in dessert pizza. Ha ha, I have no idea what to say about your bangs!!! I guess hair can be possessed, it’s technically living right??? 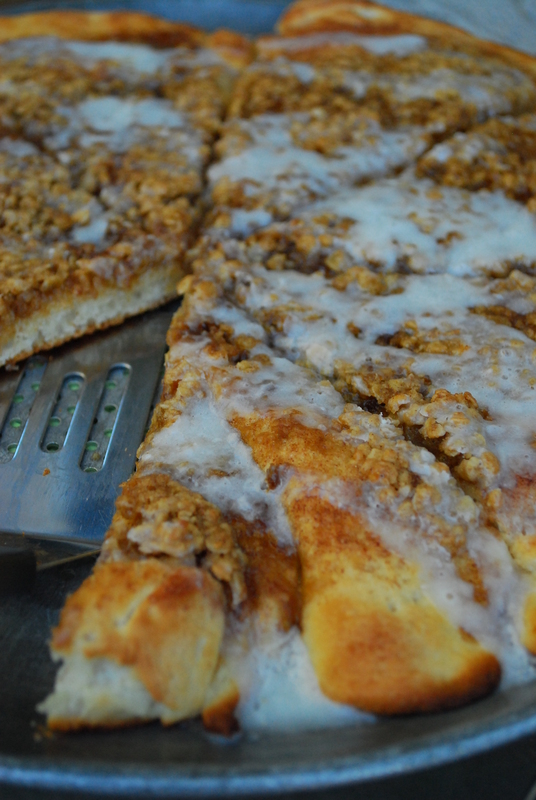 Ah well, wine coolers and THIS sugar crumb pizza will make everything all right! Love dessert pizzas! I need to go see that possession movie. I’ll probably live to regret it, but I need to see it and scream my way through it anyway. As for your hair…that’s weird. You should eat more sugary pizza. LOL! I totally laughed when I clicked on that picture of JT! I can totally relate. After a long search for the perfect stylist I decided to look no further and take my own self to the garage, shears in hand and hack away at this hair! To my surprise it didn’t turn out too bad, although for the last few days I’ve had this posessed chicken feather-y, fly away on top of my head. Maybe my hair is rebelling against my scissor antics and is screaming for help from a professional! Oh well.. To bad!! Lol! I’ve definitely cut my hair one too many times, but unfortunately it never turns out well for me. *sigh* I guess we’ll forever live with our possessed hair. I think I will continue to cut my own hair, I just can’t get someone else to understand what I want, and if I do it and mess it up I can only blame myself! Bahaha, your demon-possessed bangs sound scary! I hate scary movies, but I clicked on the Possesion link, watched about 30 seconds, then freaked out + closed the window. Yep, major fraidy cat here. What I’m not afraid of? This delicious-looking pizza. Holy yum! I will let any demon possess me if it will bring me this pizza. The bomb, dude! So, maybe that’s what’s been going on with my hair lately…possession. That must be the only answer to its total unruliness lately. Usually after a haircut, it cooperates for at least a few weeks–but I got it cut Tuesday and it still looks like a hot mess. Hmmmm, maybe I’ll try some of this pizza and see if it helps. 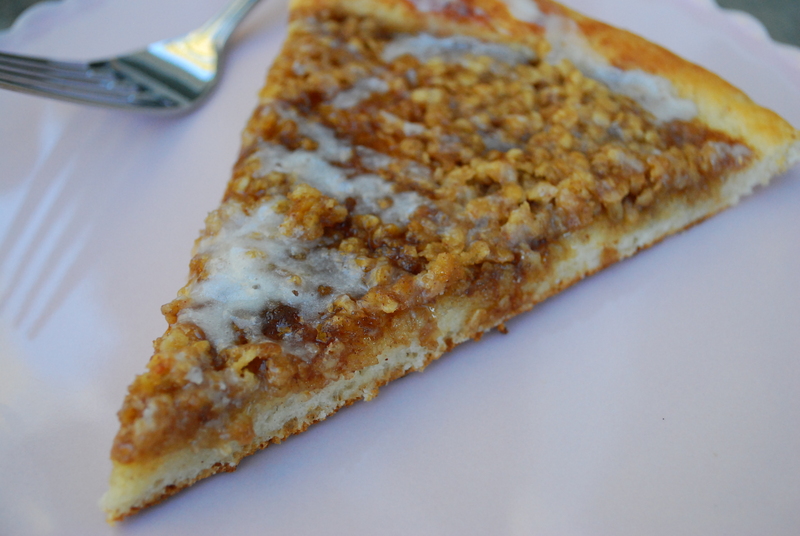 Doodle LOVES dessert pizza and he’s been asking me to make him one–this looks awesome!!! This is all over my “to-make” list! I’m thinking some roasted apples on top might be in order, too. And I NEVER watch scary movies – especially the ones with kids (I nanny!!!) – so I am with you on that! Ooh, Ashley! Loving the apples idea. That’s be bomb! So THIS is how you make that wonderful stuff at Mazzio’s! I’m going to be a hero at my house because of you! Just as soon as 2 weeks are over, I’m going to do it. Thanks. John Travolta? Bahahaha! You are hysterical, woman! The cinnamon sugar goodnes on this pizza is calling my name. And sugar cookie dough crust? Great idea! Gonna make this soon! i love me a good sweet pizza such as this!! hair styles are fun but not when you wake up to disaster!! That must be my problem over here because my hair has just been out of sorts for the last week or so. I need sugary pizza to make it all right again:-) And I was too chicken to click on the Possession link…I caught a clip of that on tv and never ever want to see it again!!! I saw Possession over the weekend. It was pretty good. Definitely creepy. I hadn’t see the previews, but I saw that it was by Sam Raimi (you’re too young to know who that is, aren’t you?). Ha! That’s why I don’t have bangs… because the’d be posessed and do their own thing! Ps.. do you deliver? 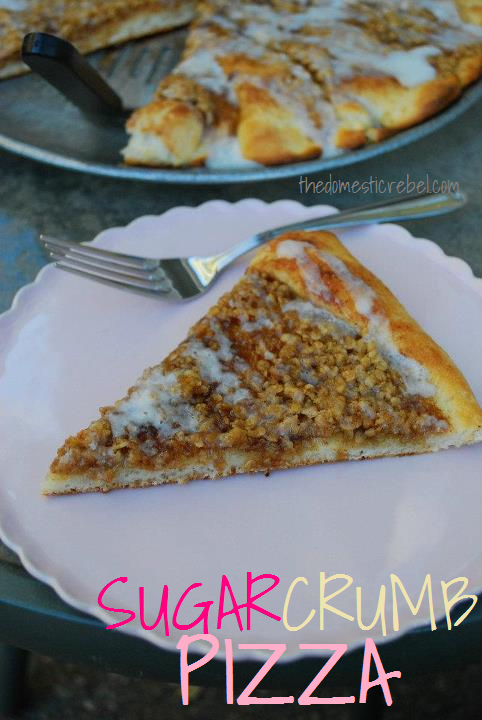 I want that sugar crumb pizza like YESTERDAY! Oh my – this might be the best pizza I have ever come across!